In recent years Disney has made a massive effort to include a lot more interesting and diverse vegetarian selections on its menus. Years ago, we’d lament that fact that’d we spend nearly our entire trip eating vegetarian burgers the consistency of cardboard. This is no longer the case, although the cardboard veggie burgers are still around, there is no excuse to eat the same boring thing day in and day out while you are enjoying your holiday at the Disneyland Resort. I’m not going to go into every restaurant, I’m just going to highlight some of our favourites, the ones that we like to return to each time we visit. These are all counter service, so price per meal would be in most cases $8-$US12 or less (without a drink). In the Disneyland Park, my favourite counter service location is Rancho del Zocalo. This a Mexican inspired hacienda building with lots of outdoor and covered seating, right alongside Big Thunder Mountain railroad in Frontierland. I’ve heard some of my American friends lamenting the “mexican food” here, but as a Kiwi, we don’t get a lot of Mexican cuisine and I really like the meals. For vegetarians, there are a number of choices and the meals are fairly large. We usually order the Red Chile Enchilada Platter or Burrito Sonora with sautéed vegetables. They also have a soft Taco option with vegetables but I don’t remember ever trying that. Meals can be ordered easily without dairy so if you are vegan this maybe a good option – but do check if the other items are vegan. Last time we visited Disneyland, despite the warm weather, I had the Tomato Soup and Grilled Cheese combo at the Jolly Holiday Bakery Cafe. Yes the soup is vegetarian and it was tasty! The cheese is that awful American variety, but on a cold day this might well be a great option. This is just at the end of Main Street near the castle end. I have on occasion had the Fried Green Tomato Sandwich at The Hungry Bear . It has cornmeal crusted fried green tomatoes layered with two slices of fresh heirloom tomatoes, topped with havarti, remoulade, jicama-mango slaw and served on a multi-grain roll. I have since heard,despite the menu description, that it might not actually be vegetarian so it would pay to check if this concerns you. This is also a wonderful location along the Rivers of America – I recommend you go downstairs where it’s quieter and sit along the water watching the Mark Twain Riverboat as it steams past. Over in Disney California Adventure, our absolute favorite place to eat is the Lucky Fortune Cookery at Pacific Wharf. For vegetarians, you order the Tofu option with a choice of sauce – Mandarin Orange, Spicy Korean, Teriyaki or Thai Coconut Curry. This comes in a square Chinese takeaway box like you see on TV with steamed rice, veggies, tofu and the sauce you chose. I haven’t tried the Mandarin Orange but I’ve tried the other flavours. They aren’t kidding about the spicy korean – its spicy! I usually go with the Thai Coconut Curry. This is a great location as its also near the Cocina Cucamonga Mexican Grill and the Pacific Wharf Cafe, so if not everyone wants the same type of food you have a number of choices. There is also a beer cart here and its right near the Ghirardelli chocolate shop (which do the best chilled coffee and chocolate drinks – YUM!). 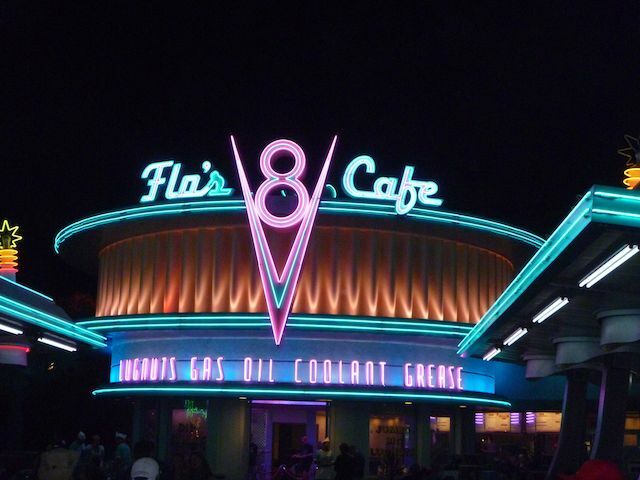 In the new Cars Land area is Flo’s V-8 Cafe, which is a cool 1950s style diner. The Veggie Tater Bake is very tasty, its basically a vegetarian cottage pie – Roasted Vegetables, Cauliflower, Bulgur Wheat, Soy Crumbles and Smashed Red Skin Potatoes topped with Cheddar Cheese. It comes with your choice of side dish from an extensive list of hot vegetables or a couple of chilled salads. Finally in Disney California Adventure, the last place we like is over in the Paradise Pier area, Boardwalk Pizza & Pasta. We really like the Portabello Mushroom and Spinach flatbread. They also do a cheese ravioli with a pesto and a rather nice salad called Boardwalk Field Greens which has Fresh Greens, Topped with Tomatoes, Blue Cheese, Cucumbers, Dried Cranberries, Caramelized Pecans, Golden Raisins with a Basil Vinaigrette. Its nice to get a couple of these options and share them to make a more interesting meal. Moving away from the parks, in the Downtown Disney area, I can’t go past the Earl of Sandwich – their caprese salad is delicious! They also have a vegetable sandwich option too. Handy hint, join their eClub just shortly before you travel (like a week or so prior) and they will send you a coupon for a free chocolate brownie. At the hotels (and you don’t need to be a guest at the hotel to use their restaurants), for breakfast, go to the counter service White Water Snacks at the Grand Californian Hotel. They have a California Breakfast Burrito which you can order without bacon – scrambled eggs, diced tomato, Cheddar cheese and red bliss potatoes. Its pretty big and depending on how hungry you are, it maybe a shareable option. Later in the day head to the Disneyland Hotel to Tangaroa Terrace. I love their Crispy Tofu Salad – Ginger-Soy Marinated Tofu fried crispy in a Coconut Panko Breading, served atop a blend of Fresh Lettuces, Cabbage, Carrots, Red & Gold Bell Peppers and Grape Tomatoes lightly tossed in a Citrus Vinaigrette. My mouth is watering just thinking about it! Further away from the parks, and you could walk if you were keen, its really not too far but after a long day at the park… on the corner of Harbor and Katella Boulevards in the Ramada Hotel is Gandhi Palace, an Indian lunch buffet. There isn’t a lot of Indian food in the area, and this was a reasonable price – from memory at only $US10 per person for lunch. Not an extensive buffet but from memory 4 or 5 vegetarian curry’s with rice, naan and dessert. There are lots of other options but these are our picks. Where do you like to eat at the Disneyland Resort?